In the last week I’ve been caught up in a bit of a Twitter-storm in which I’ve learnt just how abusive people can be towards MPs. I’ve also found out that there are lots of moon-truthers, who are convinced tides are caused by the gravitational pull of the sun. I’ve also found out that a lot of Twitter-eggs get very upset about details of gravity models of trade. Everyone else seems happy to read the academic research I have linked to, but the Twitter-eggs get very agitated, and start mixing things up. Rather than respond to all of them, I’m going to quickly explain gravity models at their most basic level. I hope the Twitter-eggs find this useful, and if they disagree I hope they write up their disagreements in an academic paper, submit it to a peer-reviewed journal and invite me along when they win their Nobel prize. To keep things as simple as possible lets move from global trade to a very simple example: selling ice-creams. We are using ice-creams as an example because I like ice-cream, and the Beach as an example because it will be easy to show that trade and tides are very different things (just in case any moon-truthers read this). So, in this example, imagine a Twitter-egg decides that they want to stop being an Egg for their followers and make some money selling ice-creams on the beach. This isn’t a real beach, so lets assume that this is possible, and they have an ice-cream stand, and all the licensing they need and they have arms, etc. Also, assume that the beach is like the beach in Brighton where it is divided up into sections. Question 1: If you want to sell more ice-creams, do you put your ice-cream stand on the part of the beach with lots of people or the part of the beach with one old-guy walking his dog? I think it is obvious that you are much more likely to sell ice-creams if there are lots of people on the beach than if it is empty. I’m not saying this will always be the case, but as an educated guess I think this is probably acceptable. What does this tell us? It tells us that the size of the market matters. You are more likely to trade (sell ice-creams) with a big market (crowded beach with lots of people) than with a small market (empty beach with a few sea-gulls). Just because this makes sense, it doesn’t mean it is true. So we can test it by looking at the relationship between trade (exporting stuff) and the size of the market and we find that there is a very strong relationship. We sell more to bigger countries because…. they are bigger and have more people able to buy our stuff. If those people are a bit poorer, as they are in China etc, then we tend to sell them a bit less. But overall there is a very strong relationship between the size of the market and trade. 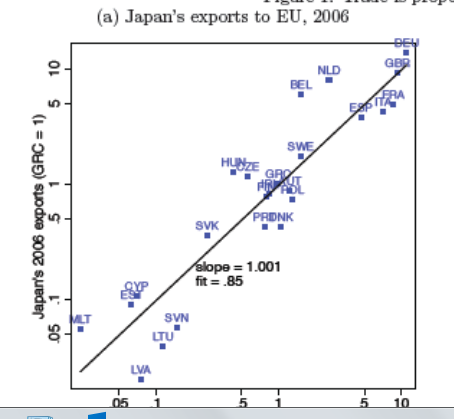 Size alone explains about .85 of the variance when looking at Japan EU trade as shown in the graph below from James Anderson’s 2016 power-point presentation (ibid). Question 2: If you want to sell more ice-creams, do you put your ice-cream close to the people on the beach on the promenade or in a car-park 2 miles down the road? Again, I think most people, and hopefully most Twitter-eggs, would accept that you want to be close to the people to whom you are selling ice-creams. And that having to walk for ages is going to make you less likely to buy an ice-cream. Again we can test this, and we do find that most of the time ice-cream sellers tend to be near the beach, although there will obviously be counter-examples, such as Mad Martha’s in Nantucket, where people are prepared to walk a considerable distance for a particularly fine ice-cream (I told you I like ice-cream). If we go from our model of the ice-cream seller on Egg-land beach to the global economy we also find that distance matters. Economists have explored how trade drops off with distance, to get an idea of how important this effect is. What we find is that distance matters, it is really, really important. If you follow this link https://t.co/3qj05uP9Dk it will take you to a paper that looks at the evidence from 1467 estimates from 103 studies. 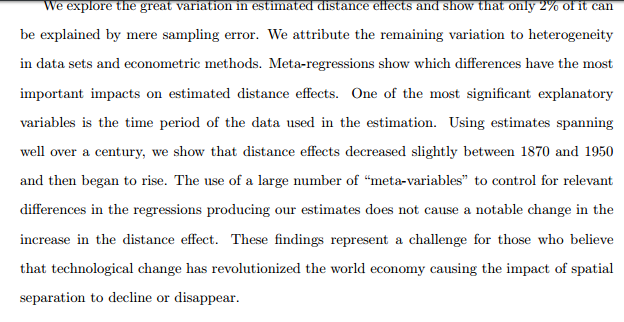 The finding in the conclusion is that there is a ‘mean elasticity of 0.9’ which means that on average trade is ‘nearly inversely proportionate to distance’. Translated into English this means that if you double the distance you half the trade. The combined effect of size and distance is similar to what Newton found with Gravity. Big things like the Sun have a lot of gravity, but we feel it less and less the further away we are. Hence economists models that combine size and distance to explain patterns of trade are called gravity models. Trade decreases with distance as an inverse relationship, while Gravity decreases with distance as an inverse squared relationship (for what it is worth, the tidal effect decreases with distance as an inverse cubed relationship, but lets not go there). Question 3: What about people ordering ice-creams on the internet, or cultural or language effects? Surely the distance effect is disappearing because the costs of moving things is getting lower and people can buy stuff on Ebay and just order the cheapest thing? In our Egg-land ice-cream stall, we would probably expect we’d sell more if we were offering choc-ices and raspberry ripple ice-creams than if we were selling snail or garlic ice-cream. And if we put in a path along the beach, that made it easier for people to travel, we’d expect to sell more. This is an interesting set of questions. It is really two sets of questions — do these effects exist and if they do how big are they compared to the overall gravity model effects (i.e. compared to the size of the economy and the distance). First up, the evidence on the falling costs of moving things around the world is very strong. Moving things is now very cheap, so we (me at least) would expect there to be an effect. Surprisingly containerisation in shipping hasn’t had as big an effect as I would have predicted. But overall costs of moving things around are now pretty small. You can get a refrigerated truck across the USA for about $5,000, and it costs £7 to get a mattress topper delivered from John Lewis to Switzerland. It turns out that there are also cultural and language effects: for example, the UK trades more with Australia and South African than we might expect. But overall these are small. The size and distance effects dominate. Moreover, we also find similar distance and border effects are important with E-bay and other electronic markets. Disdier and Head (2006) sum up their review of 103 studies with the following. The people who they are critiquing in the last line would include people like me before I looked at the evidence. So in summary, the idea that the world is flat or that we have experienced the ‘death of distance’ is non-sense. What we actually find is that distance is becoming more important to international trade. I’d have thought it was the other way around. Turns out I would have been wrong. Going back to our ice-cream stand, it would seem that our Twitter-egg can make a good living. If it is a nice sunny day, other Twitter-eggs will look up from their computers, stop abusing people who think Newton was right about Gravity, and buy ice-cream. Given there is no-where else to buy ice-cream our Twitter-Egg stall can charge high prices and make high profits. These high profits might attract a new Twitter-Egg to enter and market and open a stall. What happens then? First of all there is now competition, so if prices are too high in one stall customers will go to another. Prices will fall, consumers will benefit and profits will go down. Economists like it when consumers pay less. Now if one Twitter-egg doesn’t like having lower profits, they could convince the local council to divide up the beach and put a border between their part of the beach and the other part. If someone wanted to buy an ice-cream they would have to go across the border. They could impose a licensing system to stop competition — after all, the last thing they want if for our Twitter-egg to cross the border and trade on his beach.They could also get the border guards to charge a tariff for someone crossing with an ice-cream. And if they were really nasty they could introduce ‘non-tariff barriers’, such as demanding that anyone bringing an ice-cream across the border needed to know what was in it and where those ingredients were made — that would quickly dry up trade. What would the effect of this change be? It would be to impose a huge cost, drive up prices for ice-creams, reduce choice and make the ice-cream stalls more profit. Or seemingly more profit. The existence of the border might make people poorer so they bought fewer ice-creams, or make the beach less attractive to customers. So what does the evidence say about whether these type of effects exist, and if they do how big they are? It turns out they are really big. Even across the US-Canadian border Anderson & van Wincoop (in a paper in the American Economic Review in 2003) suggested the border was roughly equal to a tax of ≈ 40%. These sort of effects are similar in size to the ‘costs’ to trade of having to travel the fully length of the USA. This makes sense because the size of the distance effect — “double distance halve trade”- is big. Very big. Much too big to be explained by the costs of transport. So it is probably capturing things like borders (longer distances normally mean more borders) and more paper-work and other non-tariff barriers (tariff barriers are pretty small now). These non-tariff costs have a very strong influence on trade, and the reductions in trade have a big influence on the economy. This was picked up by a British politician called Margaret Thatcher, who pushed for a radical change in the way the EU worked to move from a customs union, (where you weren’t charged to take an ice-cream from one part of the beach to another), to a Single Market, (where regulations were harmonized to stop ice-cream stall owners conspiring to protect their monopoly profits). In the last 40 years economists have done a lot of work trying to work out what barriers are needed and which ones are just there to make producers rich at consumers expense. They then work to get these barriers removed. The effect of removing these barriers has been to substantially increase trade, and as a result roughly a billion people on the planet have been lifted out of poverty. Going back to the beach in Egg-land, it would seem that one way to increase the welfare of the Eggs on the beach would be to remove borders between different parts of the beach, and harmonize regulations on ice-cream production and selling so that customers could move around and buy from who-ever they liked. Producers might not like this, and it would come with costs. In particular, we would have to agree on the regulations — we couldn’t just impose our regulations on all the other beaches, and opening up borders would mean that Eggs on other beaches could come to ours. When economists at the LSE looked at the impact of harmonising regulations on real trade (rather than Eggland ice cream trade) they found it was very substantial. The difference between a Free Trade Agreement (FTA) and a Single Market was about 40%, even taking distance into account. This suggests that moving from a Single Market in ice-creams towards Free Trade in ice-creams would have a very significant negative effect on the Egg-land economy. Different Eggs are likely to value these things in different ways, and balance the benefits against the costs in different ways. This is entirely reasonable. Some people may think the costs are too high and want a new border put in. Others might like the additional choice. These are political questions, and not ones that can be answered by economics. All economists can do is tell people what they think the costs and benefits are. And whatever those figures are, it is perfectly reasonable for people/Eggs to make their own judgments on how those costs and benefits will be ranked. What isn’t reasonable is for politicians to repeatedly lie about what the costs and benefits are. The reason the Twitter-Eggs have got really upset isn’t really about Gravity or gravity models of trade. It is because they have implications for BREXIT. A lot of the BREXIT debate ignores the importance of distance and talks nonsense about replacing the EU with China etc. Distance matters, and it matters because it captures the existence of non-tariff barriers (things like borders and differences in regulations) which have a very negative impact on trade. Trade matters because it has a big impact on the economy. Non-tariff barriers matter (more than tariffs which are low now), but managing non-tariff barriers requires political compromise and sharing sovereignty. To put this in perspective, to understand how trade matters for the UK — roughly a quarter of our GDP is traded, with just under half going to the EU, and that would decline by roughly 40% if we went from being in the Single Market to just having a Free Trade Agreement. This is why the pound fell roughly 6% on the BREXIT vote. Then there are the more important longer-term dynamic effects. Trade isn’t just ice-cream, it is inter-industry trade where rather than selling cars for wine, the car industry trades components to the car industry in another country. This helps move technology around, which raises productivity. Damage to this, even if it is very small rapidly becomes large because it a compound effect (it is like the impact of a management charge on your pension, a 1% difference a year can halve your final pension). Distance matters — double the distance and halve the trade. Reduce trade reduce productivity growth. Even small reductions in productivity growth, have very big long term impacts. Twitter-Eggs may not like this. But please write your new theory of international trade up — if it is better than the gravity model you will get a Nobel prize. Don’t just send me abusive tweets with random bits of irrelevant data. If you do I’ll block you.